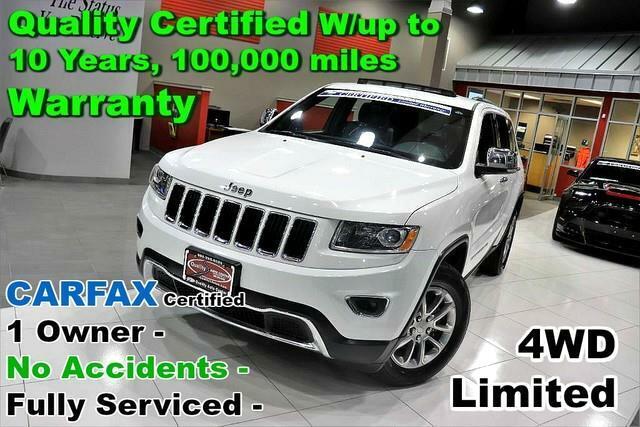 CARFAX Certified 1 Owner - No Accidents - Fully Serviced - Quality Certified W/up to 10 Years, 100,000 miles Warranty Looking for a clean, well-cared for 2015 Jeep Grand Cherokee? This is it. This Jeep includes: POWER SUNROOF Generic Sun/Moonroof Sun/Moonroof LUXURY GROUP II Automatic Headlights Variable Speed Intermittent Wipers Cooled Front Seat(s) Intermittent Wipers Daytime Running Lights AM/FM Stereo Adjustable Steering Wheel Generic Sun/Moonroof Heated Front Seat(s) Satellite Radio HID headlights Bluetooth Connection Sun/Moonroof Telematics Hard Disk Drive Media Storage Rain Sensing Wipers MP3 Player Dual Moonroof Headlights-Auto-Leveling ENGINE: 3.6L V6 24V VVT (STD) Flex Fuel Capability V6 Cylinder Engine BRIGHT WHITE CLEARCOAT TRANSMISSION: 8-SPEED AUTOMATIC (8HP70) 8-Speed A/T Transmission w/Dual Shift Mode A/T RADIO: UCONNECT 8.4 NAV HD Radio Navigation System AM/FM Stereo Satellite Radio Bluetooth Connection Telematics Hard Disk Drive Media Storage MP3 Player 9 AMPLIFIED SPEAKERS W/SUBWOOFER BLACK, PREMIUM LEATHER TRIMMED BUCKET SEATS Leather Seats Bucket Seats *Note - For third party subscriptions or services, please contact the dealer for more information. * A test drive can only tell you so much. Get all the info when you purchase a vehicle like this with a CARFAX one-owner report. This Jeep Grand Cherokee Limited - CARFAX Certified 1 Owner - No Accidents - Fully Serviced - Quality Certified W/up to 10 Years, 100,000 miles Warranty defines excellence in an SUV. It has the convenience of limitless boundaries paired with city sophistication. Taking the road less traveled has never been more fun than with this 4WD. With improved performance, mileage and acceleration, this 2015 4WD Jeep Grand Cherokee Limited - CARFAX Certified 1 Owner - No Accidents - Fully Serviced - Quality Certified W/up to 10 Years, 100,000 miles Warranty is king of the off-road. It's not a misprint. And the odometer isn't broken. This is a very low mileage Jeep Grand Cherokee. A rare find these days. Added comfort with contemporary style is the leather interior to heighten the quality and craftsmanship for the Jeep Grand Cherokee This vehicle comes with a navigation system. That doesn't mean you won't get lost. But it does mean you won't stay lost. This vehicle comes with an extra bonus: past service records are included. This Jeep Grand Cherokee is beautiful and the interior is clean with virtually no flaws. The perfect balance of speed and control has been injected into this 2015JeepGrand Cherokee. This wonderfully appointed vehicle comes equipped with the options and features every driver craves. The paint and body on this Jeep Grand Cherokee Limited - CARFAX Certified 1 Owner - No Accidents - Fully Serviced - Quality Certified W/up to 10 Years, 100,000 miles Warranty looks as fresh as the day it rolled off the assembly line. This is one of those rare vehicles that comes along for just a brief moment. More information about the 2015 Jeep Grand Cherokee: The Jeep Grand Cherokee has proven itself the premiere luxury SUV for 20 years. The latest Grand Cherokee builds on that tradition by offering civilized highway driving as well as the equipment to make a credible show off-road. The base Laredo 4x2 starts at just under $29,000 and comes very well-equipped. The top-of-the-line SRT's all-wheel-drive on-road performance rivals that of the Porsche Cayenne Turbo, but for half the price. Interesting features of this model are powerful engine lineup with diesel availability, True, proven off-road prowess, luxurious interior, and high-performance SRT variant No Credit / Bad Credit / No Paystubs, No problem !! ! All Approved ! Everyone drives ! CLEAN, GORGEOUS, LOW MILES, SHOWROOM CONDITION. CALL NOW QUALITY CERTIFIED up to 10 YEARS 100,000 MILE WARRANTY , To Certify a vehicle, there will be an additional cost for Certification. CALL NOW For details. STUNNING AGGRESSIVE LOOK ON THIS BEAUTIFUL--Call today to schedule a test drive... Good Credit/Bad Credit/No problem!!!! Get paid cash? No problem!! 100% Credit Approval with interest rates starting at 2.49% for qualified customers, our rates will not be beaten. We price our cars at wholesale price to guarantee the best deals for our customers. Our inventory moves quick, please call to confirm the availability of the vehicle of your interest Springfield location 973-564-0112. This vehicle is located at our SPRINGFIELD location. Come visit our new showroom in Springfield NJ. This 2015 Jeep Grand Cherokee Limited is offered to you for sale by Quality Auto Center. Want more room? Want more style? This Jeep Grand Cherokee is the vehicle for you. This Jeep Grand Cherokee Limited comes equipped with 4 wheel drive, which means no limitations as to how or where you can drive. Different terrains and varying weather conditions will have no effect as to how this vehicle performs. You can tell this 2015 Jeep Grand Cherokee has been pampered by the fact that it has less than 46,606mi and appears with a showroom shine. Added comfort with contemporary style is the leather interior to heighten the quality and craftsmanship for the Jeep Grand Cherokee More information about the 2015 Jeep Grand Cherokee: The Jeep Grand Cherokee has proven itself the premiere luxury SUV for 20 years. The latest Grand Cherokee builds on that tradition by offering civilized highway driving as well as the equipment to make a credible show off-road. The base Laredo 4x2 starts at just under $29,000 and comes very well-equipped. The top-of-the-line SRT's all-wheel-drive on-road performance rivals that of the Porsche Cayenne Turbo, but for half the price. Strengths of this model include powerful engine lineup with diesel availability, True, proven off-road prowess, luxurious interior, and high-performance SRT variant No Credit / Bad Credit / No Paystubs, No problem !! ! All Approved ! Everyone drives ! CLEAN, GORGEOUS, LOW MILES, SHOWROOM CONDITION. CALL NOW QUALITY CERTIFIED up to 10 YEARS 100,000 MILE WARRANTY , To Certify a vehicle, there will be an additional cost for Certification. CALL NOW For details. STUNNING AGGRESSIVE LOOK ON THIS BEAUTIFUL--Call today to schedule a test drive... Good Credit/Bad Credit/No problem!!!! Get paid cash? No problem!! 100% Credit Approval with interest rates starting at 2.49% for qualified customers, our rates will not be beaten. We price our cars at wholesale price to guarantee the best deals for our customers. Our inventory moves quick, please call to confirm the availability of the vehicle of your interest Springfield location 973-564-0112. This vehicle is located at our SPRINGFIELD location. Come visit our new showroom in Springfield NJ.